The Addams Family cordially invites you to join them for dinner at any of the following times: Wednesday, June 13th @ 7:30 p.m.; Thursday, June 14th @ 7:30 p.m.; Friday, June 15th @ 7:30 p.m.; Saturday, June 16th @ 7:30 p.m. or Sunday, June 17th @ 2:00 p.m. & 7:00 p.m. Don’t be late! 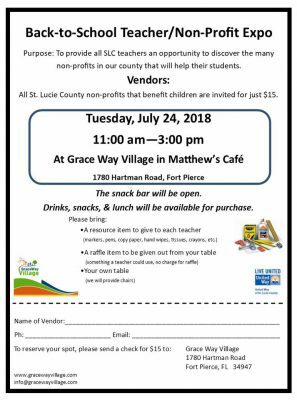 Do you know organizations/vendors who might like to participate? If so, please share this information. Discover the world right here in your own backyard! 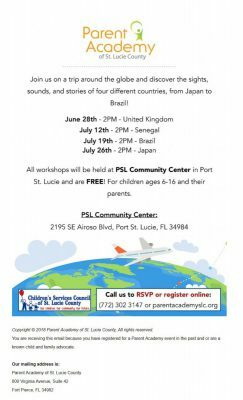 The Parent Academy is offering summer workshops at the Port St. Lucie Community Center for children ages 6 – 16 and their parents. Topics include: United Kingdom, Senegal, Brazil, and Japan. Call or RSVP online for these FREE workshops. Jamya Wiley, 2018 graduate from Lincoln Park Academy, was presented with a $1,700.00 scholarship from the Florida Dairy Farmers on June 11th in Gainesville. Jamya was one of twelve female student athletes from across the state chosen for the Academic All-State Team. Congratulations to Jamya!